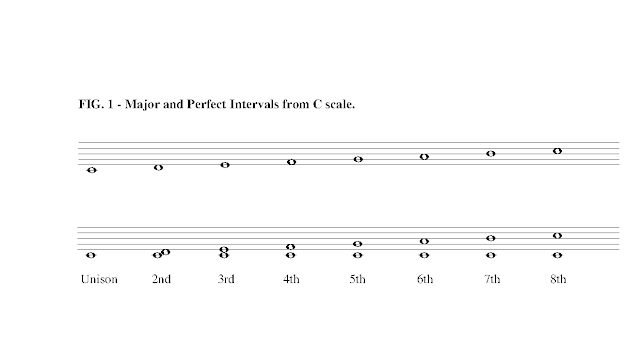 Basics of Music I - Intervals and chords. First of all, I have to say I have new songs I will upload next Wednesday, and I'm preparing the other section. And, I want to give thanks to JJ, my friend, who checks the blog and revises my English. This time JJ has checked the tutorial before upload it. Well, let's start. Modern music is composed by chords. If you want to create a song, you've to decide the harmony, and you will do this selecting some chords. However, to build correctly the chords, you need to learn intervals before. An interval is a system used to measure the distancia beetwen two sounds. It's defined by the number on notes and the distance in tones and half-tones. So, between C and F you have 2 tones and 1 half-tone. And between C-G# you have: 3 tones and 1 half-tone from C to G, and 1 extra half-tone, because of the sharp. Note that 2 half-tone make a tone. In fact, between C and G# you have 4 tones, or 3 tones and 2 half-tones. You can say it as you want. But this system is so difficult, so we use another system. Each interval has a distance in tones and half-tones, and a number to define it. The easier thing to understand is the number. From C to A, for example: C, D, E, F, G, A. Six notes. So the interval from C to A is a sixth. Another example: Db to A#. D, E, F, G, A. Five notes. So this is a fifth. But think on this: D to A, without accidentals, is also a fifth. What can we do? As you can see, from C to D the inteval is Major 2nd, from C to E, Major 3rd... and all the major and perfects intervals. You only have to change them by a half-tone to obtain another interval. If from C to E you have a Major 3rd, from C# to E you have a minor 3rd. At the end of the page there's a zip with solved exercises, and solved interval examples. Edit: Let's explain better the difference between major, minor, diminished... intervals. - For example, take C# to G. If you count, you'll find you have 3 tones exactly (from C# to D you only have half tone. 2 tones and 2 half-tones = 3 tones) It's a half-tone smaller. So this is a Diminished 5th. If you have 4 tones, it will be an Augmented 5th (For example, from C to G#). Note C# to G# has 3 tones and a half tone, is a Perfect 5th. -Let's see. The interval C - Ab has 4 tones, the same as C - G#. It's more, the notes in the piano are the same. But the first is a Minor 6th and the second an Augmented 5th. Why? C - Ab: Let's count notes: C, D, E, F, G, A. Sixth notes, so it's a 6th. Let's count the Major 6th tones and half-tones. We have the notes above. It has 4 tones and 1 half-tone. Let's count tones and half-tones from C to Ab: 4 tones. It is a half-tone smaller, so it's a minor interval: Minor 6th. The other, as we said before, is an Augmented 5th. Be careful with that: a Ab is NOT the same as a G#, E# is NOT the same as F, etc. And, in intervals, that's all. There are some strange cases comments in the examples, and methods to solve any interval. A chords is a set of three or more notes which sounds simultaneously. There are a lot of chords, but we're going to study the basics now. To build the chord, you have to take the “root”, the bass note of the chord, and do some intervals from that note. (We will see how we can change the position of the bass note in the next tutorial). -Major Perfect: It's built by a Major 3rd and a Perfect 5th . It sounds “happy” and it's represented by the root name. Ex: C, Ab. Check the link to download examples an exercises. Examples contain some particular cases, how to solve intervals and create chords from a note. The zip also has a sound file to listen to the different chords (the chords it plays are the example chords in the exercises sheet). In the next lesson, we will explain the uses of the chords in the keys and common chords progressions.